"I am a nurse with a bachelor's degree from Isfahan University of Medical Sciences. As you know, the nurse is one of the most important members of the care team and therefore has several responsibilities, such as training, advocating from the patient rights, and providing care and treatment interventions. A nurse encounters many patients each day; each with a history, clinical conditions, different culture, and a different level of education. Therefore, the nurse must have a great deal of knowledge and skills to manage all conditions, to meet the needs of all patients and other members of the treatment team. The nurse in addition to studying specialized books should be aware of articles and news related to his nursing field, in order to update and improve his knowledge. 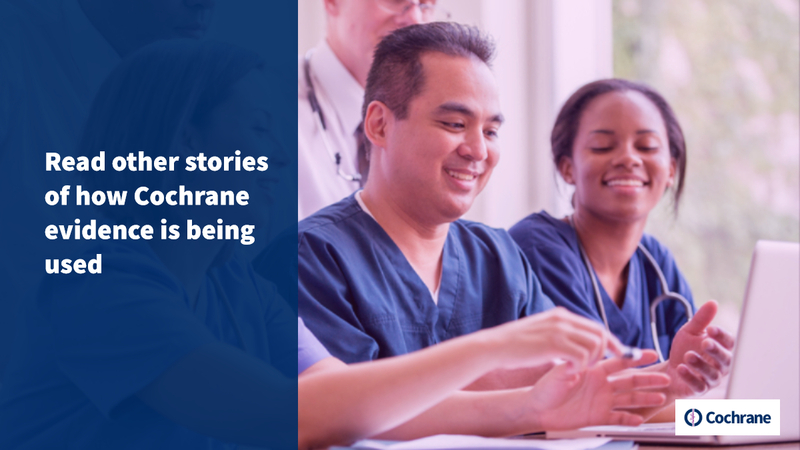 The Cochrane Library is one of the strongest sources of health evidence for nurses. Cochrane articles are very comprehensive and based on the best available evidence. Over the years, I have studied many systematic reviews from Cochrane. When I’m educating my patient or advocating from my patient's rights, I often use Cochrane evidence. Relying on Cochrane evidence, I know my patient is getting the latest, safest, and most reliable method of treatment and care, thus increasing the satisfaction and success. Cochrane is good scientific support for me and I always invite colleagues to study Cochrane articles too. Cochrane has also acquainted me with scholars across the world. I have had the honor of working on research projects with various groups of Cochrane. Cochrane has helped to increase the knowledge of my scientific and research skills." "I got my Masters of Arts degree in Health Policy as I’ve always had a special interest in population health and the role of the patient in policy making. It was through this work that I became aware of Cochrane health evidence and was particularly impressed with Cochrane’s commitment to involving patients and carers in their review production. After working in academia and clinical research, I became a Registered Nurse (RN), the decision to become an RN was because I felt as though I could make more of a difference in patient care if I combined my knowledge of health policy with clinical practice. During my nursing degree at the University of Toronto I utilized Cochrane evidence for research and papers, but more importantly, moving forward I use it often to inform my practice. I am thankful that Cochrane is a user-friendly resource that enables important decision making without hours of research. As someone with practical clinical experience, a background in research, and in policy, it is sometimes disheartening to see people spread false information on social media. It’s important to look at the source of the information you are basing decisions on and the quality of that information. When I see that Cochrane evidence is backing our hospital practices and polices, I know that I am giving patients the best possible care."